One quick simple question for you guys. Love your site. My toadstool has grown to an impressive 16 inches and is now dropping small tear drop pieces which i collect and attach to rocks. My question is my toadstool nearing the end of its life? And how long will this phenom last? I'm planning a small scale coral farm (mostly as a fun side project and maybe to help with my marine aquarium addiction) and I have a question about Biological filtration, I was wondering what you guys think would the better option, a remote Deep sand bed, live rock and refugium, just Live rock or some combination of all? and the total water volume is roughly 350 gallons. I've scoured the internet for information and found that opinions vary as they so often do and read a few books and opinions seem to vary there some what too so any help or advice you guys could offer would be very much appreciated. Thank you for your time. First, I would like to say thank you for all the information I have gotten over the past year from this website! I have a question. 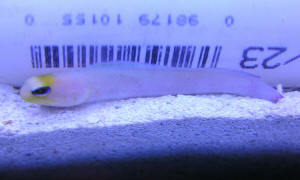 The pH in my reef system will not stay above 8.1. The PH is stable at 8.1 (does not fluctuate at all'¦ even at night). However, I still can't help but to think there is something wrong here. My water perimeters appear great.
' Photos are slightly out of date, but still fairly accurate. I am well stocked; however, I am also well filtered. So, do you guys have any idea on what could be keeping the ph at 8.1? Is this something I should worry about, or am I just thinking to deep? The fish and coral all seem to be doing great. I also have one more question. 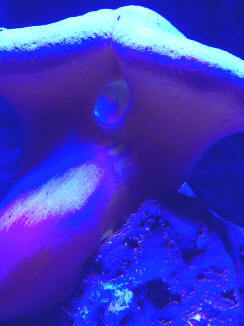 I recently fragged one of Toadstool corals (never fragged this type of coral before). The frags seem to be doing fairly well. 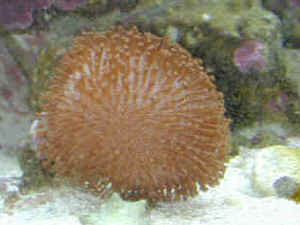 However, the mother coral refuses to stick out her tentacles. There is also a small dark film on the side that I took the frag from. She seems fine otherwise. How long should I wait before getting worried? Could the dark film be an infection? If so, what should I do about it? as always thank you for previous advice, my tanks are thriving because of you. I want to frag the whole thing into 30-40 small 1" pieces, is this acceptable? to accommodate for to much slime being released into one water stream. Both tanks have good water quality. Another question is about the deep tissue body pieces? Because its so massive and I will only be wanting a 1" wide by 1" deep piece to frag, underneath it will be a mass of tissue with no surface facing. Is this tissue able to regrow? What about the stumps left on the 3 rocks, will that regrow or just corrode the water? (for over 3 months now). The purple matting they grow on seems to be slowly receding. My nitrates are about 4ppm and no detectable phosphates. 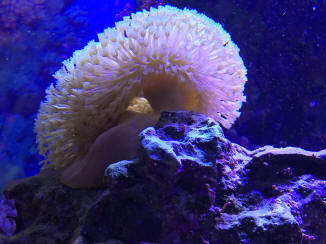 I have many other corals (xenia, SPS, LPS, Duncan's (doing wonderfully)) in this water. <Yes, I would 'fix' your lack of phosphate here first, but you have quite a mixture of corals here and it is inevitable that some will not do as well as others>. Wow, after reading so many articles about lowering phosphates and now someone is telling me to increase mine? Its funny! How do you recommend I do this? Increase my fish feeding schedule, or will the coral slime actually help with this? Also, in reference to the comment about 'skimming aggressively' to watch for the slime produced. I got a pump/bullet skimmer rated for a 300gallon tank on eBay for cheap, so I bought it even though it was way too big for my tank. and I had to dose then turn it down a bit. I can crank it all the way up to make up for the slime being produced. The only downside is I will have to begin aggressively testing and adding supplements again. When I skim this much, can I just increase my freshwater Kalk drip to make up for the extra water lost or does the skimmer remove salt also? Umbrella Leather Giant...Fragging Potential. 1/27/07 <Hello TJ, Mich here today.> BlueWater email - TJ I have been reading the blog about care recommendations for soft corals and leathers. Thanks for some good ideas. <Glad you have found it helpful!> Now to my problem - I have a umbrella leather that has prospered in my reef aquarium for a couple of years. It is healthy and still growing. <Most excellent!> It has now a trunk about 2 in diam and head about 6 in. diam. The problem is that the trunk is almost 12 in. long - attached across a large flat rock - up an adjacent rock then standing almost to the surface. <Not a problem, a potential.> I cannot find out recommendation for shortening it - Can I cut across and re-mount to another rock?? <Exactly, just frag it!> - Will the remaining trunk develop a new head?? <I would take the stalk and chop it into small cubes, each should redevelop. 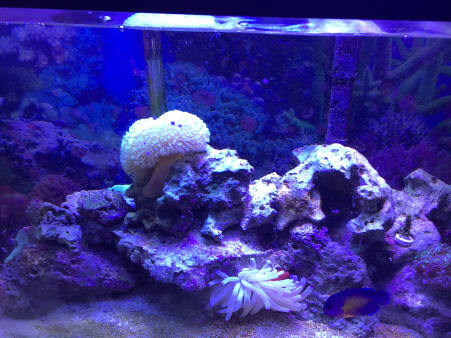 I cannot remove the rocks as other anemones are attached on side and bottom. Any suggestions. <A straight edge razor and some fishing line to sew the cubes on to some rubble rock, then share your frags with fellow reefers! Good luck! -Mich> Terry Joslin BlueWater & Assoc. Re: Attaching "Sinularia flexilis" Hey Jeff. I may be out of town this weekend so if you can send the original question ASAP that would be grrrrreat! I may get to it at latest Monday. I am so sorry about the missing text. Sheesh, what a rookie maneuver on my part. Take care! P.S. For the most part, regarding your question, I believe you would not need to remove rock even if you were to use Super Glue Gel or something to that effect. I put a little on my finger and dab the spot where the coral will be placed, and then put a little on the piece of rock for which the coral is attached. Then combine the two and hold in place (underwater) for a minute or two. Also, there are Epoxy sticks that can be used such as Aquastik or Holdfast See here: http://www.drsfostersmith.com/product/sc_view.cfm?siteid=6&pCatId=3771 or do a search on Google for other e-tailers. Also, we use at the Monterey Bay Aquarium a product called Z-spar Splashzone epoxy from a company called Z-Spar. It can be found in the Western Marine catalog (online) You will never have to buy epoxy again though as it is $99 bucks and should last you your life time. You can pass it on to your kids!!! Hope this helps!